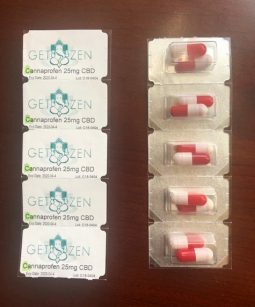 Get Zen’s Cannaprofen CBD Capsules are made with 99.99 percent CBD crystalline isolate, offering the highest concentration in the category of internally consumable CBD products. This product contains zero THC and does not deliver any psychoactive effects. Research has revealed that CBD isolates produce more desired effects in patients as compared to full spectrum CBD Hemp oil concentrates. Cannaprofen delivers the fullness of CBD’s healing benefits in just moments after use does not cause a drowsy or tired feeling, as is with the case with most other brands. Although Cannaprofen is essentially formulated for fast and lasting relief from pain and body aches, it also medicates the body, by preventing and fighting against many other diseases and symptoms. By providing options for high and low dosing of CBD, Get Zen presents a whole new approach to versatility and safety of cannabis products for internal use. Cannaprofen is tested for potency, microbials, and pesticides, and made from 100 percent organically grown cannabis plants. 2pk Cannaprofen contains 25 mg dose (per capsule) of CBD. Consistent dosing with these gel capsules drastically relieves pain, and also provides medication for auto-immune disorders, mood instability, nausea, migraines and anxiety. Ingredients: Organic Coconut Oil, Organic Cocoa Butter, CBD Isolate (99.99% pure). Perfectly relief pains and makes me happyyyyyyy! Removes pain fast! favorite capsule!!! Quality capsules as a pain reliever!!! !